In the age of technology, it can be easy to take things for granted. Information is quickly accessible through a screen, an Uber gets you from point A to point B, and we stay connected with our friends through social media. If anything, the ease of access to the things we need lulls us into going through life at lightning speed. But it often isn’t until we are without the things we take for granted that we become thankful. When your child is sick, you may feel thankful for the days they’re healthy. When your phone battery dies, you may realize how much you depend on it. But by only feeling thankful in times of loss or difficulty, we can forget that thankfulness is even more powerful in times of abundance. On Thanksgiving this year, note the traditions your family and friends cling to. 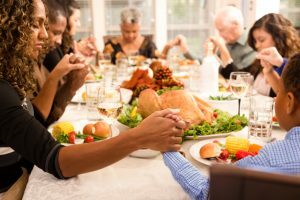 This could include a hearty dinner together, going around the table and expressing what each person is thankful for, or even just noting five things that you are thankful for. 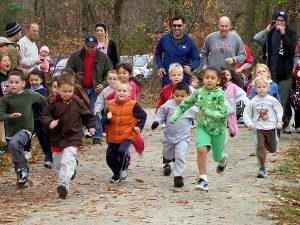 Traditions many times are also centered around being active (which we love)! This could include your family’s touch football game in the backyard, a nature walk after turkey dinner, running a local Turkey Trot, or even a little family friendly dance competition. But here’s what is most important; instead of practicing these traditions and recognizing your gratitude once a year, repeat them weekly. Remind your children, loved ones, and yourself of everything you feel grateful for and engage in activities that get your body moving with friends and family as much as possible. Fuel your endorphins. It’s easier to be grateful when you’re happy, and it’s easier to be happy when your endorphins are flowing. So get active by taking a walk, going for a run, or playing a physical game. Practice as a family. If you want your children to learn and practice gratitude, start by asking them to talk about something they’re thankful for every night at bedtime. Turn it into a bedtime story of its own, and after they’ve shared their gratitude, express your own. Journal. Once a day, write down three things you’re thankful for. Keeping a journal by your bedside makes this easy to do in the morning or before going to bed. Reread once a month. Volunteer. According to UPenn Professor Martin Seligman, giving back has been shown to be the most efficient and reliable way to increase your well-being in the moment. If you want to make the most out of volunteering, find a cause you care passionately about and add routine weekly volunteering to your schedule. Have your own way to practice gratitude with your family or friends? Tag @bokskids on Instagram or Twitter and show us how you take thankfulness beyond Thanksgiving!